When Mrs S was a child, her mother did a great deal of volunteer work teaching English to Russian and Ethiopian refugees. These people were forced to leave their homelands for fear of political or religious persecution, or were displaced due to war and famine. Some of them escaped with nothing more than the clothes on their backs, and when they arrived in the United States were initially wholly dependant ont he compassion of strangers for survival. Theirs was not a planned and careful emigration, prepared for with language lessons, realestate purchase and job interviews. They left in fear, furtive and hurried, and carried with them worries for loved ones left behind heavier than any worldly goods abandoned in flight. Mrs S didn’t know what all their stories were, but she does remember how difficult it all appeared to be: arriving in a country where you couldn’t speak the language, and few spoke yours, where you had no money, no status, and many people thought you were an intruder. And yet they seemed so glad to have these hardships over the ones they had left behind, that one knew immediately what they had run away from must have been very bad indeed. Be not deceived that this image of Mary, Joseph and the Christ child fleeing to Egypt to escape the murderous jealousy of Herod speaks only to Christians. 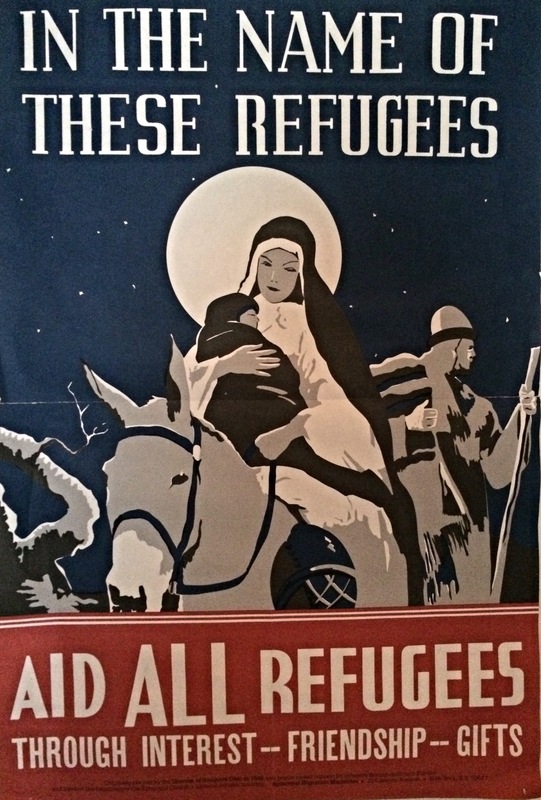 Admittedly, it speaks most clearly and accessibly to Christians in the manner of a short sharp clip upside the head: “Your Lord and Saviour was himself a refugee. When you fail them you fail Him.” But behind the religious maxim is a principle that ought rightly to be at the heart of western democratic Liberalism: the universality of humanity. Hardship and suffering do not strip away the essential human dignity of any person. The BBC is stubbornly sticking to the allegedly neutral term “migrants” to describe those fleeing from Syria and elsewhere in that part of the world. (They explain why here.) How ridiculous: as though these desperate, displaced and war-ravaged people are casually strolling into non-native lands by preference. When thousands upon thousands of people flee with nothing but what they can carry and show up at a foreign border, en masse, they are not just merely migrants. When they are willing to risk not only their bold young men, but their elderly, their women, their children, and their babes in arms, to leave their homes, to climb onto a boat that is little more than a raft, you can be sure that it is only because this fearful journey is less terrifying than what they are leaving behind. When people are fleeing an evil greater than all the perils of escape, they are not ‘migrants.’ They are refugees. There are times when Mrs S feels called to polemic, and this is one of them. The so-called ‘migrant crisis’ is suddenly getting a lot of press, probably because Syrians are not just suffering at home: they are drowning in the Mediterranean, right on the doorstep of the Western first world. (Though more drowned in April than in August, so the timing is still odd.) They are dying in the trucks whose drivers were bribed to smuggle them across Europe. They are living in tents on the streets of Greece — Greece! where we were all directing our pity so few months ago. And all of this to avoid being slaughtered in their homeland. But the situation in Syria and the broader Middle East and north Africa is neither new, nor unforseen. And for every poor soul who escapes, many more suffer violence, persecution, acute deprivation, and death in their native land. For any rich Western government to be caught unprepared, when there has been ample time to take action to avert this humanitarian crisis, or, failing that, prepare to do what is necessary cope with it, is indefensible. For those fleeing from terror and atrocity to arrive and find their place of refuge unready is inexcusable. For them to arrive and find the borders closed is criminal. It is certainly hard to know how to house and care for large refugee population, both in the short and the long term, but unfortunately they do not have the luxery of time to wait for us to figure it out. However reluctant, unprepared or unequal we feel when faced with this necessary act of mercy, now is not the time for political posturing and hand-wringing. Whatever economic or practical concerns arise, they are trivial in comparison to the plight of displaced peoples. It is not a question of resources, for Europe has the money, but of willing. We just have to take them in. There is no moral way around it. Mrs S has written and rewritten an uncharitable rant about westerners who are not willing to share from out of their vast resources, who place finances and convenience before the moral demands of humanity. But the fact is a large number of Westerners are concerned — more than concerned — about the plight of refugees. There are prolific efforts to raise awareness and form the consciences of those who still lack passion for the welfare of their afflicted brethern. Some of these come in the form of highly sensational, and hugely distressing, images of brutalised, maimed and even drowned children. Mrs S spent rather a long time trying to figure out why she was upset by this tactic. She thinks of herself as a realist, meaning that she does not imagine that facts wait upon her pleasure or approval. Photographs of this kind are deeply upsetting, but they are a vivid depiction of the nature of the evil that is stalking so many of the most vulnerable. But do images like this form a conscience to fight evil and eagerly safeguard its victims? Mrs S is concerned that the more natural response is to recoil, first from the image and then from the atrocity itself, to turn away and refuse to see what cannot be born. Those sharing the image want to ignite the moral fervour of those who disparage the “migrants” and wonder why those troublesome people don’t just stay where they are. The pictures offer a forceful proof of harm. The message of the picture is “Without our compassion more children will die like this.” But someone seeing such a picture, perhaps caught unawares (Mrs S certainly was, several times, on Facebook), may instead be brought to despair that this child had not been saved. Conscience, instead of being nurtured, is paralysed, seeking refuge in willful ignorance or desensitisation. Better, if possible, to form conscience through diligent example, tireless witness, and, bluntly, making a nuisance of oneself to show that the truth and the urgency of this crisis are more than passing media fads. admonish the sinner, instruct the ignorant, council the doubtful, comfort the sorrowful, bear wrongs patiently, forgive all injuries, pray for the living and the dead. For those who want a simple rubric for virtue, there is no truer guide. In everyday life, do these things. When you encounter great need, do these things. Wheresoever you go, do these things. In the name of these refugees, do these things.